Inbetween this and the closing tag there are a number of tags like this: <dc:…> … </dc:…> or like this: <opf:…> … </opf:…> each one of which defines an item of metadata associated with your e-book. The actual title is contained within the two <dc:title> and </dc:title> tags. This is what you entered in the metadata editor dialog and should exactly match how you want the ebook title to be displayed on the e-reader. Remember that the filename can be anything you want. It is what the e-book reader finds in the metadata which gets displayed. As described elsewhere, ‘dc:’ is an xmln namespace code which explains to the e-book software which particular meaning it should understand title to have. ‘dc:’ stands for ‘Dublin Core’ and the specification for this convention can be found here: http://dublincore.org/documents/dces/. And, yes, I know this is NOT the URL given in the opening <metadata …> tag. It was, however, the best link I could find to explain the Dublin Core protocol. The way the e-pub specification builds on and extends the dublin core protocol is complicated, and I will explain this as it arises after describing how to use the metadata editor in Sigil for each piece of the metadata in turn. 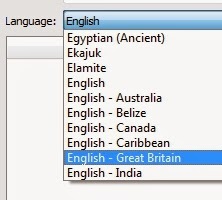 which has the correct code: en-GB for UK English sandwiched between the opening and closing <dc:language> tags. The code is in two parts. The first part (en) identifies the langauge as English, in accordance with International Standards Organisation (ISO) standard number 639, the official website for which is here: http://www.loc.gov/standards/iso639-2/php/English_list.php. The second part is a qualifier for British English (-GB) following ISO 3166 (which can be found here: https://www.iso.org/obp/ui/#search.) The way these two standards are combined is in accordance with the guidance obtainable from here: http://www.ietf.org/rfc/rfc3066.txt. Sigil inserts the correct code for you. A quick check showed that a very small number of obscure languages assigned a code in ISO 639 are NOT in the drop-down menu in Sigil. I would have thought in the unlikely event that your ebook was in one of these langauges you would need to manually edit the content.opf entry and substitute the ISO 639 code yourself. Luckily, Sigil will in most cases be able to enter the correct information in the metadata part of content.opf for you (and also see further comments below). It might be necessary to do this by editing content.opf manually using an html editor such as Komodo Edit, rather than in Sigil, which might possibly delete an entry if it doesn’t recognise the code. See my post on how to ‘unpack’ an e-book to edit the contents for more details of how to edit content.opf using an html editor. So that covers the basics. 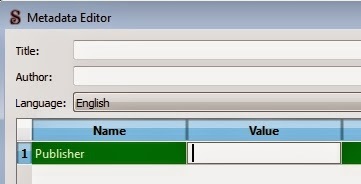 Each row of the table has four columns: ‘Name’, ‘Value’, ‘File As’ and ‘Role’. The first column contains the name of the item of metadata you are adding (or editing). The second holds the value of that metadata. The last two coulmns are only relevant for certain items of metadata, and I will go into their role below as it becomes necessary. As you can see, the entry follows the same syntax as all the others described above. For this item of metadata, the other two columns in the metadata editor dialog cannot be opened. 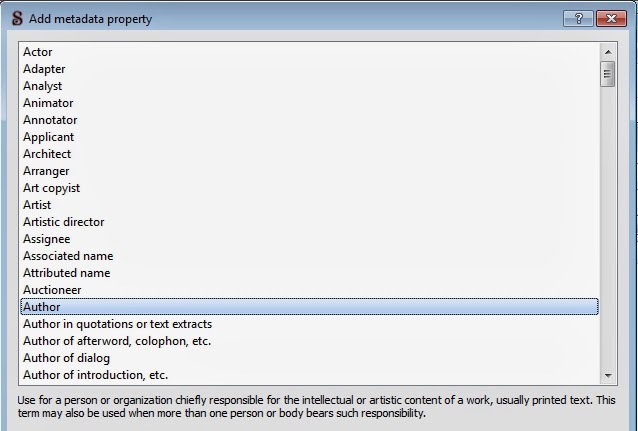 In the items described below, enter the data in the ‘Value’ column in the Metadata Editor dialog. You might want to create a lengthy entry here in MS Word and then save it as unformatted text and paste it into the Metadata Editor. Particularly so if, like me, you are picky about insisting on curly quotes which you will have difficulty entering by typing directly into the Metadata Editor window. Additional Language: In addition to the language you selected from the drop-down menu in the top part of the metadata editor dialog, you can specify a further language, if relevant. Simply select ‘language’ from the ‘add basic’ dialog and a row is added to the metadata editor with ‘language’ in the ‘Name’ column. Just type the name of the language in the ‘Value’ column and Sigil will look up the correct language code for you. An additional entry is made in the metatdata for the second language as outlined above. HOWEVER, if you type a language which is NOT supported, such as ‘Polari’, ‘Kalaallisut’ or even ‘Vulcan*’, Sigil will create a blank tag instead: <dc:language></dc:language>. If you save the file or perform another operation, this blank entry will disappear completely. I would have thought entering the ISBN of a sequel to a novel would make it easier for sites like Amazon to suggest a reader might want to buy the sequel if they have already bought the first book. The first thing to point out is that the value: 2014-09-12 is the date in reversed order. Then note the bit which says opf:event="publication" in the opening tag. This is how the epub consortium decided in their wisdom that it should be communicated to the e-reader that the value represents a publication date. 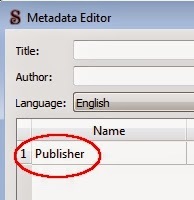 To change the publication date in an e-pub, just open the metadata editor and alter the entry in the value column. The date will be updated in the metadata automatically. Of the other three possibilities, creation and modification dates work in exactly the same way. Sigil enters ‘creation’ or ‘modification’ in the ‘File As’ column and opf:event="creation" or opf:event="modification" respectively in the metadata. HOWEVER, according to the e-pub standards, you MUST enter ‘revised’ as a single lower case text string, with NO CAPITALS or SPACES. The same goes for any other ‘custom’ date you enter. As I have said, the date is in reverse order. At least a year must be entered as four digits. The month by itself can be added or else the month and day can be added if you want to. If a month or day is included each must have two digits. Include leading zeroes for values below ten, as indicated in the example above. Coming back to that opf:event= statement, this an xml extension defined in the opf specification. It was devised to extend the Dublin Core, to allow different kinds of dates to be associated with the e-book. On the face of it, it’s a rather untidy way of doing this but, as it builds on existing conventions, it is the most logical way of achieving the flexibility required for creating rich metadata in e-books. I should add that Sigil has a habit of editing/adding to the date metadata as you go along, so sometimes I find it has added or updated a modification date in the metadata after I have been editing the file. I would advise checking the metadata just before commencing the conversion to kindle and also just before publishing the e-pub, to correct anything Sigil did behind your back. The way Sigil deals with identifiers is similar to how it deals with dates. To enter an ISBN as an identifier for your e-book, just select ‘Identifier: ISBN’ from the ‘add basic’ dialog. In the metadata editor, ‘ISBN’ is pre-entered in the ‘File As’ column and all you need do is to type the ISBN in the ‘Value’ column. Entering an ISSN (International Standard Serial Number, used for periodicals) works in exactly the same way, just select ‘Identifier: ISSN’. Another identifier in use in the computing world is a ‘digital object identifier’ or DOI (the website for which is here: http://www.doi.org/). If you want to associate a DOI with your e-book, enter it in the same way, by selecting ‘Identifier: DOI’ from the ‘add basic’ dialog. Finally, you can enter a custom identifier. Just select ‘identifier (custom)’ from the ‘add basic’ dialog and proceed in the same way as for custom dates. Sigil enters ‘customidentifier’ in the ‘File As’ column. You should replace this with the kind of identifier you want to include and enter the value for it in the ‘Value’ coulmn. See immediately below for an example. One custom identifier you might consider using is the ASIN, or ‘Amazon Standard Item Number’, which is assigned to your e-book by Amazon after you have uploaded it to the kindlestore. This could be an alternative to the ISBN if you have decided to publish kindle-only without buying an ISBN. You would have to upload your e-book to the kindlestore, find out what ASIN has been assigned to it by Amazon and then edit the original file to include the ASIN as an identifier and re-upload the e-book. The ASIN should remain the same after you have re-uploaded your e-book. When Sigil makes a blank e-book, it creates an identifier for it using a scheme called a ‘Universally Unique Identifier’ or UUID. This is a long string of characters which is generated by your computer according to an alogorithm which is intended to produce a unique string of characters. Of course, it isn’t entirely foolproof, but the high likelihood is that the UUID will be just that … erm … unique. For the curious, there is an online UUID generator here: https://www.uuidgenerator.net/, which has a brief description of how a UUID is generated. References to the actual specification can be found by consulting Wikipedia. If you think about it, Sigil would have to have done something of the sort when it created the file. It is compulsory that there be at least one identifier for the e-book, and Sigil cannot know in advance what the ISBN or other identifier will be. By entering a UUID in the meantime, Sigil ensures that the blank e-book which it creates complies with the e-pub standard. Within the opening <dc:identifier …> tag, opf:scheme is an extension defined in the opf specification to specify which identification scheme (ISBN, ASIN, UUID, DOI, etc) the entry describes. In this case Sigil has entered opf:scheme="UUID". Other identifiers would follow the same syntax: opf:scheme="ISBN" etc. In the example, b25e5002-0004-4435-ba01-52ec365266ea is the UUID generated by Sigil when I created the example file. It is prefixed by urn:uuid: which is telling the e-reader software that what follows is a ‘uniform resource name’ using a universally unique identifier. Apart from opf:scheme="UUID", the other thing inside the opening <dc:identifier …> tag above is id="BookId". This labels the identifier. At least one identifier needs to be listed in the metadata and one of these has to have a label. The label is used in the opening <package …> tag to mark that identifier as the unique identifier to be used for the e-book (see here in my previous post for details). Sigil has used "BookId" as the label but, logically, it could be anything you wanted, PROVIDED it matches in the <metadata> and the <package>. If you do this, be aware that the line in the metadata containing the unique identifier cannot be edited by the metadata editor. 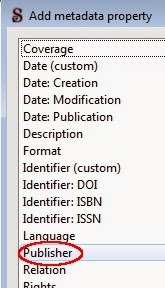 Making the ISBN the unique identifier removes it from the table in the metadata editor dialog.You will have to make such changes by editing content.opf directly using Sigil. I ought to add that, as the identifiers are only seen by the software: all the reader sees is just what you have entered on the title page verso (copyright page), I can’t see any reason for changing the unique identifier. But, if you wanted to, that’s how you would do it. The epub specification allows very rich metadata to be added for the various people who have contributed in some way to the creation of an e-book. But this comes with a cost: the system they have chosen to employ is just a bit complicated! To add an author, select ‘Author’ from this list and click OK. Sigil adds a row to the table in the metadata editor dialog with ‘author’ in the ‘Name’ column and ‘contributor’ in the last column, which is now headed ‘Role Type’. Type the new author name in the ‘Value’ coulmn and then retype it as it should be alphabetised in the ‘File As’ column. Select ‘Creator’ for a main author or select ‘Contributor’ for a secondary author. Proceed in exactly the same way for any of the other contributor (or creator) roles from the ‘add role’ dialog. The opening tag contains these TWO opf fields: opf:file-as, which we have already covered, and opf:role. In this case a code is specified: opf:role="aut". EACH role from the add role dialog has an associated code. There is a complete list of these here: http://www.loc.gov/marc/relators. If a code for a role does not exist in that list, you can make one up, beginning it with ‘oth’ followed by a full point and then the text for your custom role (as a single lowercase text string). Casting around a bit for an example, I came up with ‘oth.fluffer’ for a very crucial role in the making of a certain kind of video! All you need do to edit an entry you have already created in the metadata is to open the metadata editor and alter the relevant row of the table. All necessary changes to the metadata in content.opf will be made for you. At a late stage of preparation, you should be able to use this post to help you edit content.opf manually using an html editor, if that becomes necessary. As a final note, if you select a row in the table in the Sigil Metadata Window and then click the up or down arrow buttons, the item is moved up or down in the list. The guidance says that if there are multiple contributors/creators in the metadata the e-book reader software should presume that the names are in the order in which they are intended to be displayed in the ebook. As far as I can determine, all other items in the metadata section can be in any order. 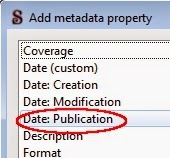 To delete an item of metadata, select it in the metadata editor window and click the ‘Remove’ button. This is the example given in the Kindle Publishing Guidelines. You will have to edit it in using an html editor, such as Komodo Edit. See my post on how to ‘unpack’ an e-pub for information on how to do this. The name="cover" item is MANDATORY and should be entered EXACTLY as typed above. The other item in the tag ("my-cover-image" in the example) should be the id (or label) given to the cover IMAGE in the <manifest>. See my posts on how to delete the html cover and how to link the cover IMAGE for kindle (in that order) for detailed instructions on how to adapt the cover in your e-pub for kindle. The <manifest> is explained in my next post. I have repeated this information here because it is of relevance to the <metadata>. You should ignore this discussion if you are creating an e-pub, it is only relevant to Kindle. I have gone into the guts of how the metadata is specified here. In actual fact, using Sigil to do all the hard work for you is by far the best approach. In fact it makes sense to create an epub using Sigil BUT ENTER THE METADATA for your KINDLE e-book. Then convert the epub into a mobi file using kindlegen and finally edit the original epub to change the metadata to their proper epub values. That way Sigil can be relied upon to get things right for you. Your e-book will inevitably be listed on many different websites. For an e-book with an ISBN these websites will most likely use the data supplied to the booktrade databases, such as Nielsen in the UK and I guess R. R. Bowker in the USA. The metadata embedded within the e-book may well also get picked up by the websites listing it and may not necessarily be identical with that held by Nielsen/Bowker. There could be a conflict between the two and I would advise carefully monitoring the situation and being ready to make changes to the metadata if a problem arises or/and contacting Bowker/Nielsen to rectify any problems at their end. Perhaps it would be best to end with a note that you will have to manually edit the metadata for your ebook when you link the cover IMAGE and html table of contents for kindle. Click the links for details. Next Steps: Now the metadata is correct, you are ready to test your e-pub e-book and proceed to convert it to kindle. I will continue explaining the remainder of content.opf and then go through how to test your e-pub using the built-in tools in Sigil and also using epubcheck. Very complete information! Thank you for sharing!